We’re a team of relatable, reliable and a-little-bit-nerdy, number-loving ladies ready to handle your bookkeeping. Would you like to receive emails from us? When you first start a business, you have big dreams about where it might take you and what kind of opportunities may arise, but over time it can be tough to gauge just how well the business itself is doing. We’ve gathered seven criteria to help you measure your company’s success. 1. Profit – This might be the most traditional & basic measure of success, but it’s important: are you making money? 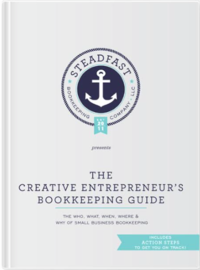 When you look at your bookkeeping reports monthly, are you making a profit? Is it a profit that will sustain you and your business and is it an amount you feel satisfied with or does it motivate you to grow more and watch the number rise? 2. Client Relationships – A bit more subjective, client relationships are an important way of weighing the strength of your business. Are your clients the ideal fit for you? Are they happy and loyal, returning to you whenever they need something? To you feel a personal connection to their needs & tastes? 3. Market Stance – Do you feel competitive in your market in both your pricing and your offerings? Comparing yourself, and your business as an extension of yourself, to others can be really challenging and should be done in moderation, but it is a good measure of where your business stands in relation to others and where it can go. 4. Education – Do you continue to learn more about your craft and try new things? Are you refining your business practices, reducing your costs and expenses to increase your profitability? Having a good bookkeeping practice will help you analyze these details over time and help you continuously improve your bottom line. It will also help you to make informed decisions. If it’s time to grow, your bookkeeping should inform you about what kind of budget you have to work with – whether it be towards marketing, investing in inventory or a new tool, or hiring a new employee. 5. Community Response – If you are in the wedding industry, community response is an amazing thing. You will typically be collaborating with vendors time and again. Do you find that people are referring you to their clients? Are they reaching out to you when they are working on special projects? If you’re in another creative industry, are you involved in groups (like The Rising Tide Society) and do you feel like they bring your business unique and personal connections and opportunities? 6. Ability to Adapt – Does your service or product allow room for change if necessary? This can mean the difference between growth or sadly, failure. Sometimes the market changes, and if you can’t adapt along with it, you may lose out on future successes. 7. Love of the Game – Lastly, and maybe the most important deep down, do you love your business? Does it make you happy, feel fulfilled, and motivated? It’s a big question and sometimes the answer will be a resounding YES or heck no. Being a small business owner requires a resiliency and ability to self-start, even if you don’t feel like it. If you love it, you’ll continue to seek success and reach it. Are there any ways of measuring success you feel like we missed? We’d love to hear from you on some of these gauges – whether they be quantitative that you can measure with bookkeeping or subjective and introspective!